Comments Off on Bruins get Clipped by the Eagles! Bruins get Clipped by the Eagles! 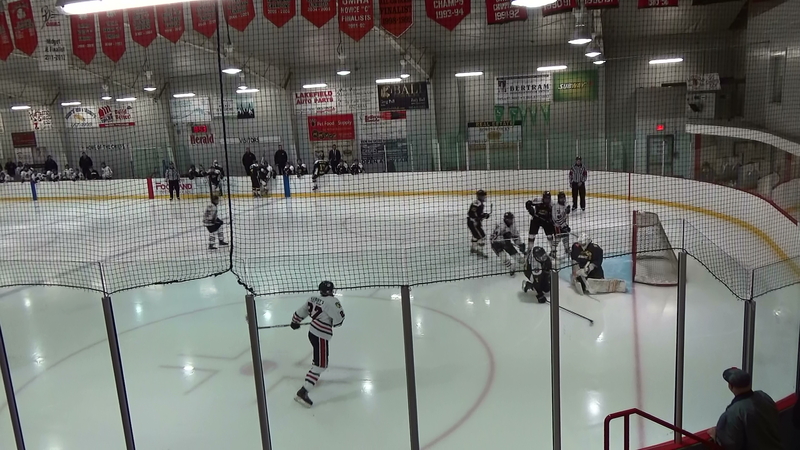 It was a good start as Kyle Spataro got his team on the board for a 1-0 lead 4:13 into the game but the Eagles came back with 4 straight including an empty netter for a 4-1 final. Ryan McConkey stopped 37 of 40 shots in goal for the Bruins. Uxbridge host the Mojacks Fri. Dec. 1st at the bear den. Comments Off on Uxbridge Back in the Win Column! Uxbridge Back in the Win Column! With several players out of the lineup due to injuries or suspension, the Bruins dug deep and left the Little Britain Arena with a well deserved 5-0 win as Jake Joosten picked up his first shutout of the season. The Uxbridge squad led 1-0 after the first on Kieran Beaudoin’s goal and added two more in the second and third periods. Michael Rennie, Simon Feig, Cameron Moffitt and Daniel Wu found the back of the net. Uxbridge travels to Clarington on Thursday Nov.30th to play the Eagles. Comments Off on Chiefs To Much For The Bruins In A 7-4 Loss! Chiefs To Much For The Bruins In A 7-4 Loss! Uxbridge loses 7-4 to Lakefield tonight as the Chiefs open up a 4 point lead in first. Kieran Beaudoin with two and Cristian Giorgio with Noah Donaghy score for the Bruins. Ryan McConkey takes the loss in goal. Uxbridge is in Little Britain Sat Nov.25th at 7:30 pm. Comments Off on It’s crowded at the Top! It’s crowded at the Top! 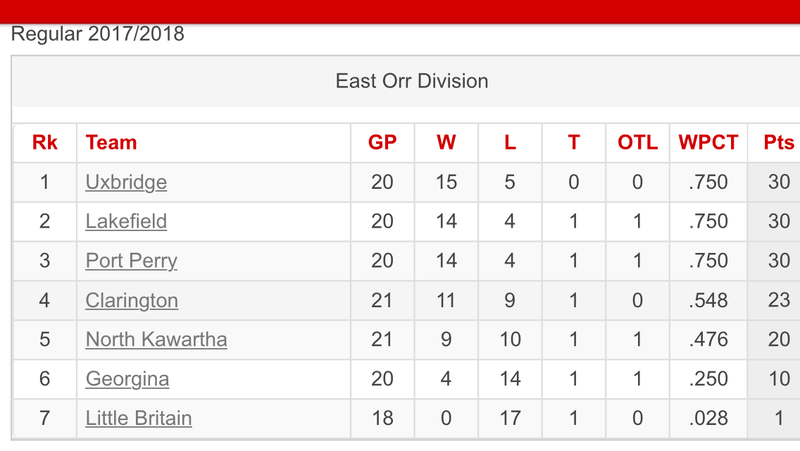 The Uxbridge Bruins, Lakefield Chiefs and the Port Perry Mojacks all have one thing in Common, “30 points” for a three way tie for first place in the Orr Division. 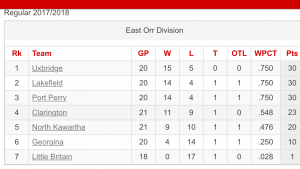 The Mojacks defeated the Clarington Eagles 2-1 to add to the logjam at the top. Uxbridge Host the Lakefield Chiefs on Fri. Nov.24th at the Bear Den. Comments Off on Bruins Cruise to 9-1 Win over the Ice! Bruins Cruise to 9-1 Win over the Ice! Welcome Nolan Kellachan to the Uxbridge Bruins. 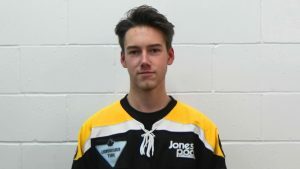 Nolan is a defencemen who comes to us from the Port Hope Panthers. The Bruins melted the Georgina Ice tonight at the Bear Den rolling to a 9-1 victory. 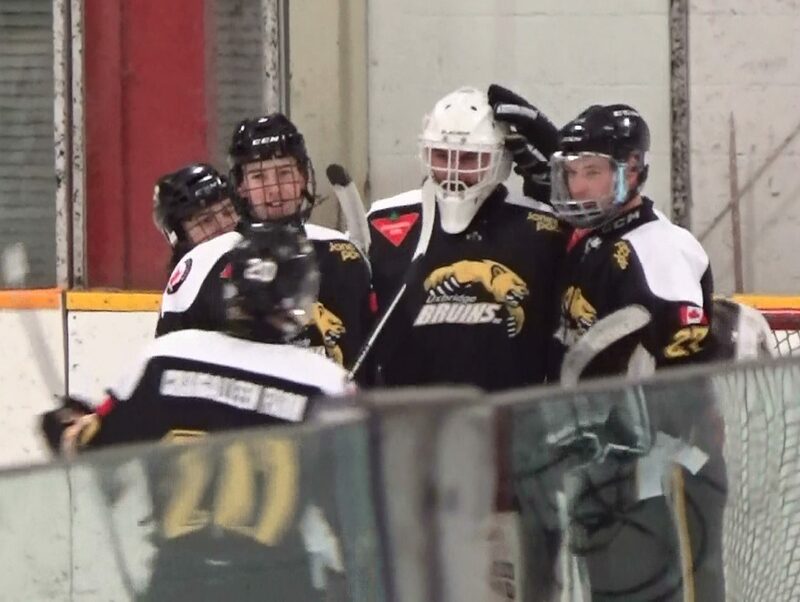 After a closely contested opening period that saw the Bruins claw their way to a 1-0 lead, tge Uxbridge offence exploded for seven goals in the middle frame. We would add another in the 3rd period before the Ice broke up our shutout bid. We’ll enjoy a much-deserved break before next Friday’s game against the Lakefield Chiefs at the Bear Den. Comments Off on Bruins Maul the Mojacks! 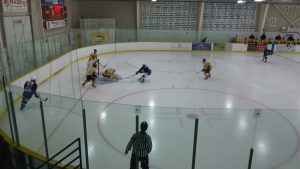 The Bruins mauled the rival Port Perry MoJacks this afternoon at Scugog Arena, skating to a 3-0 shutout win in the #BattleOfNorthDurham. Carson Bell, Cristian Giorgio and Matthew Hunter scored for Uxbridge, with Ryan McConkey turning away all 41 shots by the MoJacks to earn his 6th straight win and league-leading 4th shutout of the season. Comments Off on Bruins Get a Big Win Over Clarington! Bruins Get a Big Win Over Clarington! In a tightly contested affair against the rival Clarington Eagles, the Bruins prevailed by a final score of 3-2. Michael Rennie had the lone goal of the 1st period, but the Eagles would soar back to tie the game after 40 minutes. 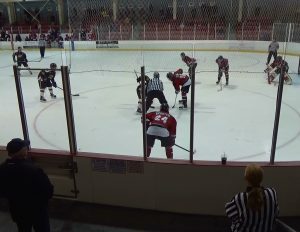 Just 13 seconds into the 3rd period at the #BearDen a powerplay goal by Robert Freckelton put Uxbridge ahead for good, with Kieran Beaudoin extending the lead just past the halfway point of the period. A late powerplay goal by the Eagles drew the visitors within one, but they couldn’t get anything past Ryan McConkey late,as he stopped 42 of 44 shots for his fifth straight win. Comments Off on Bruins get a Scare in Georgina! 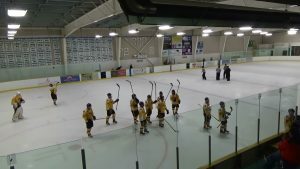 Bruins get a Scare in Georgina! 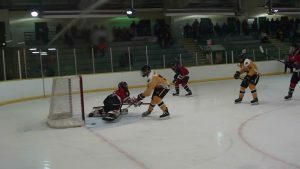 The Uxbridge Bruins came out flat against an upbeat Ice team today and fell behind 3-1 before coming alive for 6 straight goals in a 7-4 win. 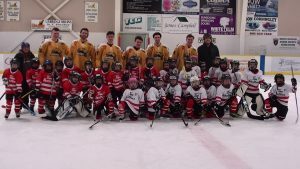 The Bruins goal scorers were Noah Donaghy with two, Mathew Hunter, Simon Feig, Kieran Beaudoin, Aiden Reilly and Damien Heinle. Ryan McConkey got the win but had to come off for one shift when he went to the bench for a new stick. Jake Joosten faced one shot in relief. 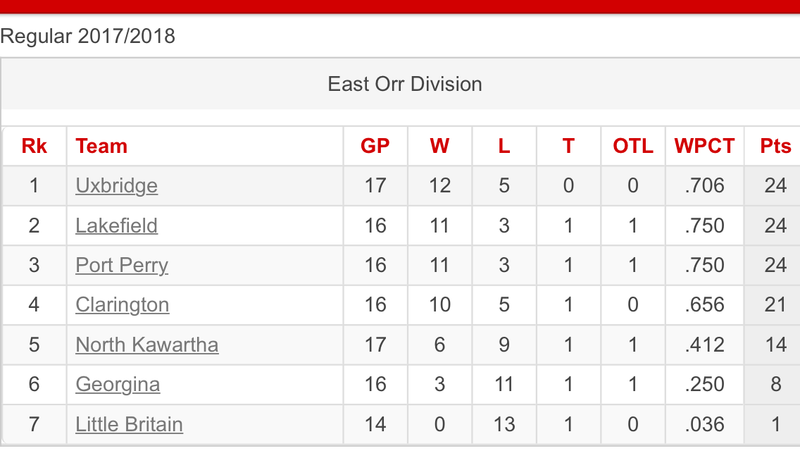 It’s crowded at the top of the standings with a three way tie between the Bruins, Chiefs and the Mojacks. 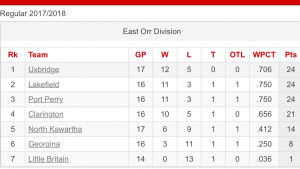 Clarington is only 3 points back and they are in town Friday Nov.10th at the Bear Den. Comments Off on Uxbridge takes a 5-2 win over the Knights! Uxbridge takes a 5-2 win over the Knights! #Bruins skate to a 5-2 win tonight in Uxbridge over the North Kawartha Knights. Goals from Michael Rennie and Simon Fieg gave Uxbridge a 2-0 lead heading into the 3rd period. In the final frame Rennie added his second of the night, with Adam Bartholomew and Noah Donaghy rounding out the Bruins’ scoring. Ryan McConkey stopped 37 of 39 shots to improve his record to 7-2-0 on the season. Box score courtesy of #Pointstreak. 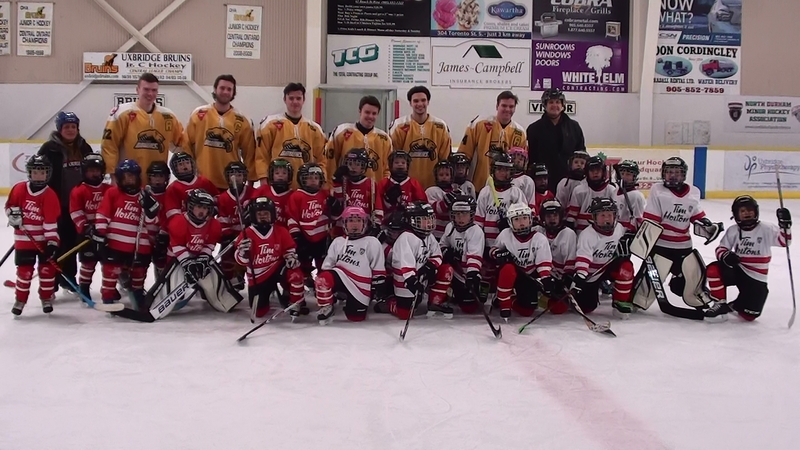 Comments Off on Short Benched Bruins Lose in Lakefield! 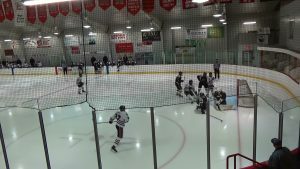 Short Benched Bruins Lose in Lakefield!